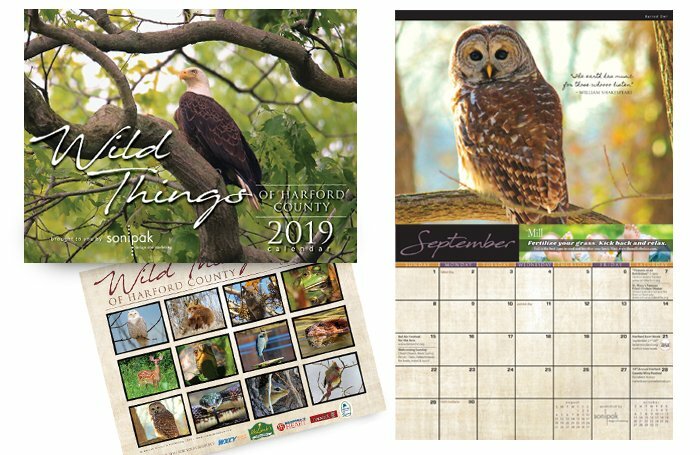 In our mission to share the beauty that surrounds us here in Harford County, we bring you our 2019 Calendar titled “Wild Things of Harford County”. This is the 4th in a series of original, stunning calendars brought to you by Sonipak Design. This opportunity will give our residents, and visitors alike, twelve captivating wildlife photographs from photographer Frank Marsden, founder of the Eden Mill Nature Committee, Inc.
Sign up to receive emails about our next calendar and other upcoming projects and publications. Proceeds from this calendar benefit . . . Founded in 1991, a group of community leaders and educators formed the Eden Mill Nature Committee, Inc., a non-profit organization and recreation council. Eden Mill Nature Committee, Inc., is a non-profit volunteer run organization that creates and supports educational and environmental programs and partnerships for our surrounding communities. Their goal is to inspire people to care about the environment by providing experiences that lead them to understand their connection to the natural world. Thus, providing an opportunity for all people to develop a greater appreciation and awareness of the historical and natural resources of the area. With the support of many businesses in the community, Eden Mill Nature Committee, Inc., created the nature center and mill museum. The park is home to a meeting room, pavilion, meadow gazebo, pedestrian bridge, extensive hiking trails, year-round environmental education programs, handicapped accessible canoe launch, and educational wetlands. There is a very symbiotic relationship between Eden Mill Nature Committee, Inc., and Harford County Parks and Recreation to meet the needs of the community. Stop by to see more of what is going on at Eden Mill! A Bit of History . . . The Stansbury family built the gristmill in 1798 and the mill was named Stansbury Mill. In 1896, a deed to the property referred to the mill as Eden Mills. It is believed that the mill was named after Sir Robert Eden, the last royal governor of Maryland. In 1965, Harford County Department of Parks and Recreation acquired the mill and 57 acres. An additional 60 acres was acquired in 2008. A local Harford County resident and wildlife and nature photographer, Frank has captured through the lens of a camera and the eyes of a naturalist these native creatures in their natural surroundings. His photography practice allows for complete immersion into the moment, clearing his mind, focusing on what is around him and observing wildlife at its purest. Mr. Marsden, a long-time supporter, community activist and former President (and founder) of Eden Mill Nature Committee, Inc., found his calling and love of nature when Eden Mill was bound for the bulldozer. His passion for starting the county’s first nature center was sparked when he came across an ad in the paper sometime in the 1980s as the Harford County owned property was seeking the community’s input on what to do with the park and deteriorating buildings. The Director of Parks and Recreation and the County Executive at that time both liked the idea, but explained there was no funding available. Mr. Marsden then placed an ad in the paper searching for community volunteers who would like to help create a nature center. His volunteer work along with many who joined him, have kept Eden Mill Nature Center alive and thriving for everyone to enjoy.